Good morning from Augusta. The federal government shutdown continues after the Senate failed on Thursday to pass dueling plans from President Donald Trump and Democrats. Meanwhile, a first act of the new Maine Legislature may be to provide some relief to workers. Maine’s Republican senator said ‘the end is in sight’ for the shutdown, but nothing is certain right now. The partial government shutdown is in its 35th day on Friday and it is already the longest one in U.S. history. Friday is supposed to be a payday for federal workers who have been working without compensation during the shutdown. The real action aimed at ending the shutdown is in the U.S. Senate, where Trump’s plan — which would provide $5.7 billion in border wall funding and enshrine new immigration restrictions — failed Thursday, alongside a Democratic plan to open government until Feb. 8 without wall funding. 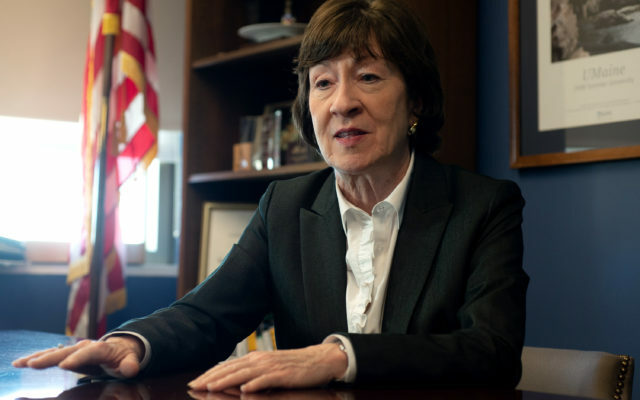 U.S. Sen. Susan Collins, R-Maine, supported both of those proposals in an aim to reopen government. She was one of six Republicans to support the Democratic bill, which got one more vote than Trump’s proposal in the Republican-led chamber. Maine’s other senator, independent Angus King, backed only the Democratic proposal. On the Senate floor, Collins said she saw the votes as a glimmer of hope. But there were new roadblocks as well on Thursday, when CNN reported the Republican president was drafting an emergency order and identified $7 billion that could be reallocated for border security. Leaders continue to talk, and Collins is among a group of 16 senators — also including King — negotiating among themselves, but it’s not clear what Trump will accept. Still, Collins said “the end is in sight” on the shutdown and she was hopeful that a deal could be reached by the end of next week. Maine’s Democratic governor is backing a legislative leader’s plan to guarantee loans to the state’s federal workforce. Senate President Troy Jackson, D-Allagash, has proposed a bill guaranteeing interest-free loans up to $5,000 for those who’ve been working without pay or furloughed in the shutdown. The text of the bill hasn’t been released, but Jackson spokeswoman Christine Kirby said the Finance Authority of Maine would administer the loans, which a federal employee would be able to access through a local bank or credit union. The bill will need two-thirds support in both chambers to take effect immediately and it could reach the floor for passage by next week, when there should be more clarity around how much longer the shutdown will last. An emboldened Democratic majority in the House pushed through a rule change that Republicans say limits transparency. Despite Republican opposition, the Maine House of Representatives on Thursday voted 91-53 in favor of a proposal from Assistant House Majority Leader Ryan Fecteau, D-Biddeford, that prohibits members from photographing or videoing colleagues during session debate. “Technology certainly has an important role in our work,” Moonen said, but its use in the chamber shouldn’t “distract us” from that role. But Assistant House Minority Leader Trey Stewart, R-Presque Isle, said he and his colleagues “don’t see a purpose for this rule,” especially when the Senate has no equivalent restriction. “We feel it’s almost a solution in search of a problem,” he said. Maine’s new congressman was named to his second committee on Thursday. U.S. Rep. Jared Golden, a Democrat from the 2nd District, announced on Thursday that he had been named to the House Small Business Committee. Golden, 36, is a Marine veteran and former Maine legislative leader who also serves on the House Armed Services Committee. He is beginning his first term after beating former Rep. Bruce Poliquin in the first upset of an incumbent in the district’s modern era and after the first congressional race in U.S. history to be decided by ranked-choice voting. As is almost always the case on Fridays early in the legislative session, the State House docket is light today. Only one panel, the Government Oversight Committee, is due to meet today. They start at 9 a.m. and are scheduled to discuss a new report on a tax rebate program for Maine businesses. Click here to listen. Committee action accelerates next week, when confirmation hearings on most of Mills’ Cabinet nominees are scheduled, including the highest-profile picks by the new governor — Jeanne Lambrew for health and human services and Pender Makin for education on Thursday, then Michael Sauschuck for public safety on Friday. Here’s their soundtrack. Mills will speak in Bangor tonight. The governor’s office said she’ll deliver “brief remarks” at 7 p.m. annual awards dinner held by the Bangor Region Chamber of Commerce at the Cross Insurance Center. — A longtime administrator for the Maine Medical Association will lead the governor’s efforts to combat opioid addiction. On Thursday, Mills announced that Gordon Smith will fill a new position to oversee what she hopes will be a more coordinated response to the epidemic. In her inaugural address, the new Democratic governor said her choice for the new position would “marshal the collective power and resources of state government” to stem the crisis. Maine has struggled to find an effective response to an opioid addiction epidemic that has led to a spike in overdose deaths in recent years. In 2017, fentanyl and heroin drove Maine’s overdose death total to 417. Mills campaigned on a plan to fight the opioid crisis. Her predecessor, Republican Paul LePage, sparred often with Democrats in the Legislature over how to allocate state resources between treatment, prevention and interdiction. — Another associate of the president has been arrested. The Associated Press reports that Roger Stone, the self-defined political “dirty trickster” who played a role in Trump’s presidential campaign, was arrested Friday in Florida on charges of witness tampering, obstruction and false statements. — Proponents of preserving working waterfront won a key victory in Boothbay Harbor. A nonprofit group formed to protect public access to the water announced Thursday that it has signed a purchase-and-sale agreement to buy Cap’n Fish Motel on the east side of Boothbay Harbor. Developer Paul Coulombe had previously tried to purchase the property as part of his plan to add to his array of upscale properties designed to make the coastal town a destination for affluent vacationers. — A Maine prisoner has been charged with killing another inmate last year. Prosecutors announced Thursday that Zachary Titus is accused of murdering Dana Bartlett while the two were cellmates at the Bolduc Correctional Facility in Warren. Bartlett, 28, was reportedly terrified of his cellmates, according to former inmates who spoke to the Bangor Daily News. They said Bartlett asked a guard multiple times to move him to another cell in the hours before he died. The guard allegedly refused to move him. Corrections officials, including acting Commissioner Randall Liberty, who was warden at the time of Bartlett’s death, rebut those claims. The next time someone tells you that data don’t lie, point them to this study by QuoteWizard that ranks Maine drivers as the worst in the United States. “Are you kidding me?” I texted while speeding up to make sure my Honda Fit didn’t swerve on black ice. Regardless of what data points QuoteWizard wants to cherry-pick, Massachusetts drivers are far worse than drivers in Maine, where I have navigated highways and byways with nary an dinged bumper for more than 40 years. Conversely, Massholes’ reputation for bad driving is well deserved. I learned how to drive in Massachusetts. They taught us how to be jerks in driver’s ed. “When in doubt, use the middle finger instead of a turn signal,” is standard operating procedure. Putting Massachusetts 21 spots above Maine is a travesty. But an even bigger travesty is that Rhode Island drivers rank higher than both Maine and Massachusetts on the safe motorist list. QuoteWizard deems them to be the ninth safest drivers in the country. I got sideswiped by a Rhode Island driver who tried to pass me on the right. In a hospital parking lot. And that wasn’t even my worst encounter with a Rhode Island driver. My first thought was: It’s Rhode Island; there must have been a payoff. Stretching that thought further, I figured that the roadway safety ranking must have been inflated because insurance company data don’t account for roadside “claims adjustments” that take place immediately after Pawtucket fender benders or transactions that occur underneath a broken light near the end of a pier, which is where I once bought a Toyota in Rhode Island.